If you’ve ever been in an airport with time to spare, odds are that you stopped for some quick grub at a kiosk or sat down with your travel companions for nice meal. After all, eating is a big part of the airport experience, especially if you have a connection and there’s not much else to do. But few travelers are aware of the story behind the restaurants they find at the airport. One of the biggest operators of airport restaurants, HMSHost, started as single newsstand near the train station in Kansas City, Missouri. Now it operates in approximately 120 airports around the world, including the 20 busiest airports in North America. Its dining establishments are also found in 99 travel plazas located along highways in the United States and Canada. Atousa Ghoreichi, HMSHost’s vice president of marketing, spoke with RewardExpert about the company’s ability to position itself in different corners of the world. HMSHost was founded in 1897 in Kansas City as Van Noy Railway News Company, selling newspapers and snacks in train stations during a time railways were a booming new mode of transportation. But its focus shifted in the mid-20th century, away from railway stations, steamship lines and bus terminals and toward airports and highways. In 1954, the company was awarded its first airport contract in San Francisco International Airport. In that same year it established a toll road division, and opened its first plaza in West Virginia. Today, HMSHost is part of Autogrill, a food services company based in Italy, and remains focused on providing travelers with innovative dining options. According to Ghoreichi, the company’s consistent focus on culinary innovation, along with experience and vision, has allowed it to thrive though more than a century of change. The company recently launched the Host2Coast mobile application. 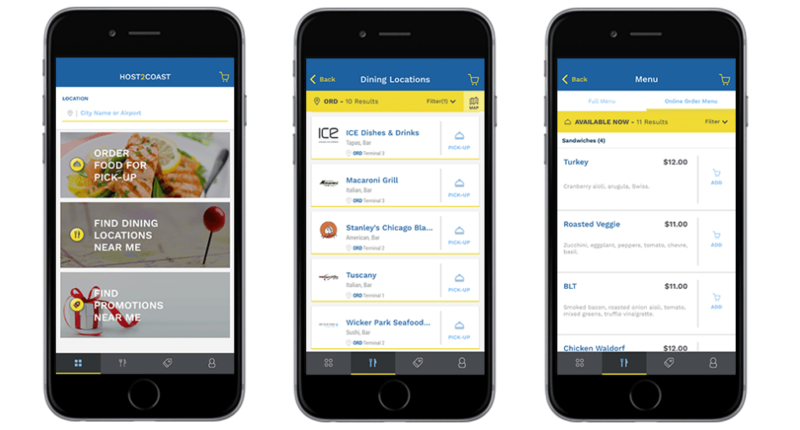 The app lets travelers in North America find the HMSHost-operated restaurant closest to them, order food in advance and, at select establishments, even pay for their food through the app. The app’s evolution will continue, with new features including promotional offers, loyalty rewards and more. Since the world of travel never stops, neither does HMSHost. For the third time, the company is a sponsor of the James Beard Awards, honoring chefs and the cuisines they create. In May the company will participate in Airport Restaurant Month. New HMSHost restaurants including Hugo’s Cocina, Landry’s Seafood and Cadillac Mexican Kitchen have recently opened in George Bush Intercontinental Airport. Next year the company will also open restaurants at the Louis Armstrong International Airport, serving New Orleans. “As restaurants, dining habits, and travel keep evolving, HMSHost will continue working hard to set the pace in the industry and show that HMSHost is a restaurateur who just so happens to operate in airports,” Ghoreichi said. For more information visit HMSHost’s website.